Brandt Stickley has a mission: he wants to help his students learn to treat not only what they see, but to develop even more subtle diagnostic skills. Through years of study and practice, he has learned to watch, sense and listen carefully to his patients, closely attuning to their pulses. 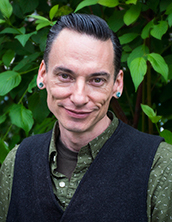 He says, “My passion is exploring the confluence of Chinese medicine and psychology.” It is this careful attunement that has greatly assisted his patients suffering from a variety of psychological and neurological disorders. Stickley joined NUNM’s faculty at the College of Classical Chinese Medicine (CCM) in 2009, and is now a supervising attendant to CCM students at the NUNM Health Centers. He is a licensed acupuncturist, herbalist, author, and a practitioner of the ancient art and science of classical Chinese medicine. He’s a graduate of Cornell University and American College of Traditional Chinese Medicine in San Francisco, and completed his internship in Hangzhou, China. He has studied Contemporary Chinese Pulse Diagnosis since 1998 with Leon Hammer, MD, with whom he has worked closely. Stickley says he is very excited to live in the Northwest. “NUNM embodies my passion for the medicine, as exemplified by Dr. Heiner Fruehauf.” Stickley is joined in Portland by his wife, Jennifer, and their son Jonas. View Brandt Stickley’s Curriculum Vitae.